While the actual net profit of the Société des alcools du Québec is now 1.7 times higher than in 1989, productivity at the state-owned corporation has stagnated over the entire period. In other words, there have been no true productivity gains since the late 1980s. This is the main finding of a recent study by the HEC Montréal Centre for Productivity and Prosperity – Walter J. Somers Foundation. 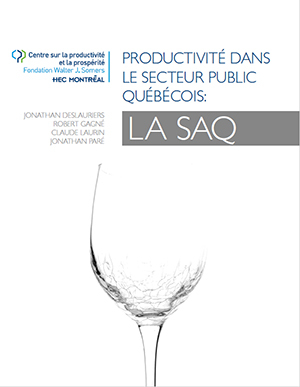 The study analyzes the relationship between the SAQ and its sole shareholder – the Quebec government – and finds that there are few incentives for efficiency. Although the state-owned corporation has clear objectives in terms of dividends to be paid, there is no mechanism to ensure that these dividends are accompanied by improved efficiency. Since the SAQ is a near-monopoly faced with little competition, it enjoys extensive control over its retail prices and operating costs, and consequently over its profits. This allows the corporation to declare a large dividend every year, without having to worry about the efficiency of its operations. The productivity indicators developed by the CPP show that the SAQ’s expansion strategy in the late 1990s hindered its productivity. It was unable to efficiently manage the rapid growth in the number of outlets, and its productivity declined drastically. In the end, although this expansion considerably boosted SAQ sales, it was at the expense of efficiency. And despite the significant productivity gains in recent years, they have barely made up for the productivity losses over the past 27 years.